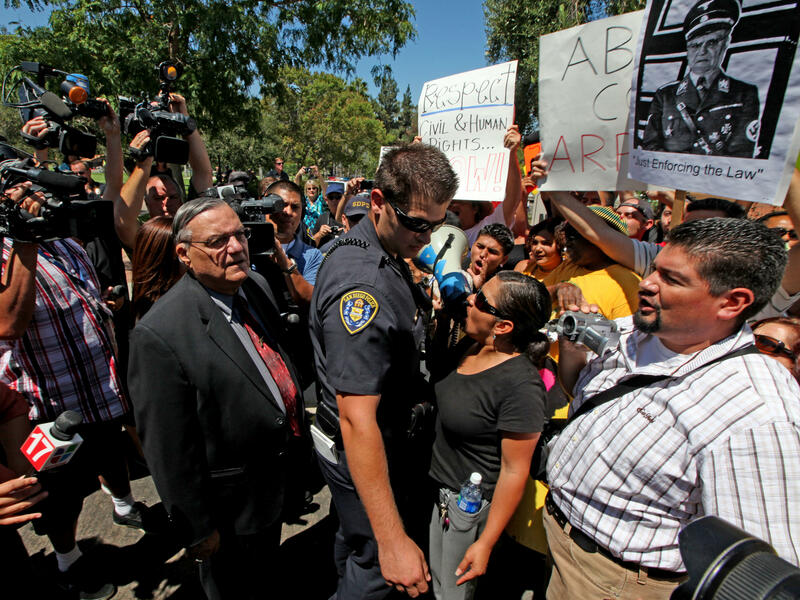 Arpaio confronts protesters during a 2010 rally in Rancho Bernardo, California. Former Maricopa County Sheriff Joe Arpaio surrounded by protesters and members of the media at the the Republican National Convention in Cleveland last summer. He was voted out of his Maricopa County office in November but now faces his own legal troubles — a criminal trial begins Monday in which he is accused of ignoring a federal judge's order to curtail his crackdown. Many in the Latino community are happy to see the tables turned on him. "These immigration raids tore our neighborhood apart," said Lydia Guzman, an activist who helped sue Arpaio over those tactics. "I see different families with kids I see you know people enjoying themselves," she said at a crowded Mexican restaurant, not far from where many of Arpaio's operations took place. "This is what it should have been all along. Not people living in and fear and trying to hide." In 2011, a federal judge told Arpaio he could not detain immigrants just because they lacked legal status, since that job is primarily for federal agents. Yet for about 18 months, Arpaio's deputies violated the order. They kept arresting unauthorized immigrants and dropping them off with Border Patrol. When the judge found out years later, he found Arpaio in civil contempt of court. Then, last fall, under President Obama the Justice Department decided to criminally prosecute Arpaio for disobeying the judge. The charge against Arpaio is criminal contempt of court, a misdemeanor. One of Arpaio's lawyers, Jack Wilenchick, called the timing of the prosecution "problematic." "It was filed only two weeks before his election," he said. Arpaio's supporters believe this criminal case is really about politics — Democrats trying to hurt a Republican sheriff. Those supporters hoped the Trump administration would drop the criminal case. But even though President Trump is friendly with Arpaio and the two see eye-to-eye on immigration, prosecutors are moving forward. Wilenchik says the case is hypocritical. "The federal government is prosecuting him for doing something that the federal government told him to do," he said. "Border patrol has been telling local law enforcement forever to call them if they encounter an illegal alien." Wilenchik plans to argue the judge's order wasn't clear and that Arpaio did not intentionally violate it. This criminal case stems from a long-standing racial profiling lawsuit Latino drivers and passengers brought against Arpaio and his office. In 2013 the judge ruled that Arpaio's immigration enforcement tactics unfairly targeted Latinos. Arpaio also gained national attention for "Tent City" — an outdoor jail that he opened in the 1990s as part of his "tough on crime" stance. Inmates lived outdoors in the Arizona heat and were issued striped jumpsuits and pink underwear. His successor announced earlier this year that it would be shut down. If Arpaio, now 85, is convicted, he faces a fine or up to six months in prison. 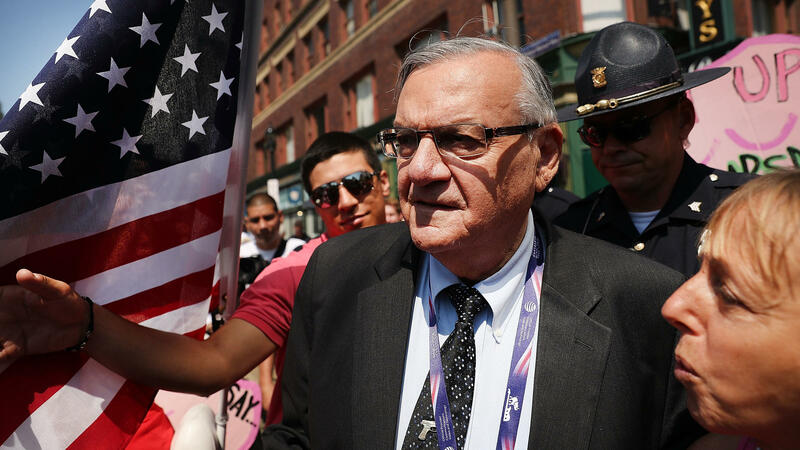 Though this case is really about whether or not Arpaio purposefully disobeyed a federal judge's order, Lydia Guzman sees this trial as a chance to hold Arpaio accountable for the impact his immigration crackdown had on the Latino community. "His legend will be that he destroyed our community and he got busted for it."